it has been a while since a rainbow chard update has graced these pages… but here it is! i dyed 4 skeins of each color, but a couple sold at pgh knit and crochet, so check quantities if you have a project in mind. there’s also one more colorway, but the mosaic did not permit me to get it in, so it’s a surprise over in the shop. rainbow chard is the perfect yarn for these patterns: baby beau, baby belle, beau, belle, reflection hat, baby eggplant, and the snow cat hat. it also is very nice mixed and matched with commercial and handspun yarns. 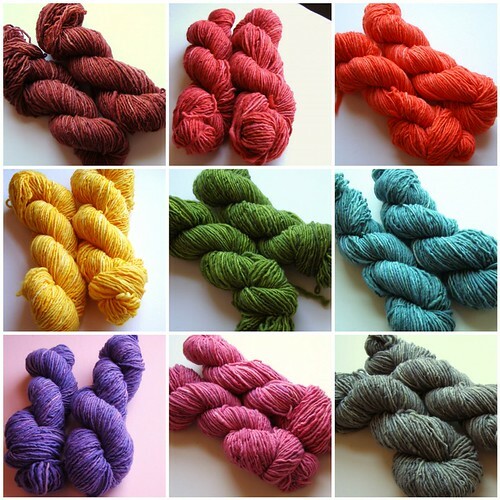 This entry was posted in cosyknitsliterally, dyeing, knitting, update, yarn by cosymakes. Bookmark the permalink. OMG the green & yello are amazing. You really have a talent for color! Beatufiul dye job!